For the past decade Russia has been engaged in a brutal conflict in Chechnya, where separatists have employed a range of tactics to put pressure on their enemy and draw the world's attention to their fight for independence. In little more than a week, two airliners have been brought down in a suspected co-ordinated attack, 10 people killed in an apparent suicide bombing in Moscow, and children taken hostage in a school in southern Russia. None of the incidents has been directly pinned on Chechen separatists, but the fact that the attacks have coincided with presidential elections in the republic has fuelled intense suspicion. All three incidents appear to bear the hallmarks of Chechen separatists, who have staged some dramatic attacks in the past decade to press the demand for a sovereign state. Hostage-taking has long been a key weapon in the separatists' arsenal with a series of major dramas, the first just six months after Russian forces marched into Chechnya in 1994 to halt the republic's secession. On that occasion, rebels herded hundreds of civilians into a hospital in the southern Russian town of Budyonnovsk. A hundred people died during the rebel assault and a botched Russian commando raid. In the years that followed, a Russian ferry with 200 passengers aboard was seized, and in March 2001 a plane on its way from Istanbul to Medina was hijacked by pro-Chechen gunmen. 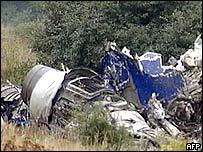 Both incidents ended without major loss of life. But the drama which stunned the world was the Moscow theatre siege of October 2002, when some 700 people were taken hostage as they watched a performance in the capital. One hundred and twenty nine hostages and 41 Chechen fighters died when Russian troops stormed the theatre. Most were killed by the gas used to knock out the hostage-takers. The seizure of a school in the southern Russian town of North Ossetia has raised painful memories of that siege - and how it concluded. In both the Moscow theatre attack, and this latest incident, the perpetrators - wearing explosive belts - made clear that they would, if necessary, end the siege by transforming themselves into human bombs. Indeed, since making its first appearance in 2000, the suicide bomb has become a regular feature in the separatists' campaign. 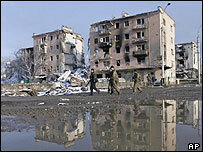 A string of such attacks in the past four years have been blamed on Chechen militants. The bulk of these have been carried out in Chechnya itself, targeting Russian-backed institutions, personnel and military facilities. But more recently, civilians in Russia have been in the firing line. In July 2003, an attack by two female suicide bombers at a rock concert in Moscow left 15 people dead. In December of that year, six were killed in an attack outside the Kremlin. In February 2004, 39 people lost their lives when a suicide bomb blast tore through a crowded Moscow metro train. The bombers had proven their readiness to attack civilian transport when they blew up a train in the Stavropol region of southern Russia, killing at least 44 people, just two months before. Tuesday's blast outside an underground railway station in Moscow which left 10 people dead, has been seen in this context, with reports of a female suicide bomber seen shortly before the attack. The authorities have yet to declare who is responsible for the downing of two passenger jets in August, but taking the suicide bomb to the skies, some observers believe, would be a logical next step for separatists. Traces of explosive - which investigators say has been used in Chechen attacks in the past - have been found amid the wreckage of both planes. It is thought possible that someone wearing a belt of plastic explosives could have passed undetected through the x-ray security system of the airport where both flights originated. Investigators are seeking information about two Chechen women believed to have been aboard - one on each plane. One Islamist group has posted a statement on a website saying it had carried out the attack on behalf of its Chechen "brothers" - but its veracity has been cast into doubt. Little is known about the group - the Islambouli Brigade, which said that five of its followers had hijacked each plane - and questions have been raised about the strategy of hijacking a plane if there were explosives available to bomb it. Rather than detonating explosives on board, the al-Qaeda militants of 11 September, 2001 hijacked the planes in order to use them as missiles, flying them into high-profile buildings in the US. The use of suicide bombing as a general tactic is nevertheless seen by Moscow as proof that Arab radicals hold sway in Chechnya - a theory which enables them to fit the conflict in Chechnya into the wider US-led war on terror. But many Chechens say those behind the attacks are simply the distraught wives, sisters and mothers of men killed or brutalised by Russian soldiers. Nonetheless, some links between Chechen fighters and al-Qaeda are deemed likely. It has been known for years that Muslim volunteers have travelled to Chechnya to join the fight, reportedly after attending training camps in Afghanistan or Pakistan. "It is among Chechnya's ruins that Vladimir Putin built his path to power"